As with most cultures, we are perennially exposed to art which is subject to the male gaze; so it is a rare work or societal insight that provides the opposite. 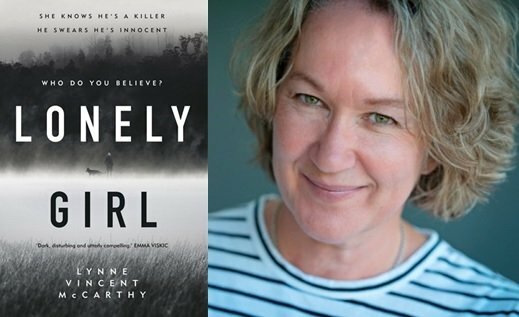 Lynne Vincent McCarthy’s first novel Lonely Girl provides a fascinating, if disturbing, insight as to the ways and motivations of an isolated woman placed in extraordinarily empowered circumstances. The novel tells of Ana, living just outside of Hobart. She’s the daughter of a woman of little regard in the town, and given a life of lacking consequence, finds herself with a dying dog and very few whims of her own to keep living. She’s planning to end it all with the aid of prescription meds stolen from her pharmacy workplace, until the local police find the body of a woman who Ana had seen in the act with a man who was not her husband. Drawn to the scene of the crime, things take a turn for the unexpected, and a strange dynamic emerges out of a moment of terror. Much of the plot mirrors that of Stephen King’s Misery – a man held against his will by a woman whose feelings towards him are, shall we say…complicated. But the similarities between the two end there, and are superficial only. Lonely Girl works (and works marvellously well) as a character study of a woman who is the victim of emotional abuse, or distance. Denied the essence of human comfort, the character Ana is one to act out, be prone to an active imagination, and given moments of crisis, emerges as a character imbued with not only self-preservation, but a wealth of personal curiosity and opportunism. Lonely Girl is the window to a troubled soul, and despite the questionable actions the character takes, we’re seldom placed at a moral or personal distance. And it’s told from a woman’s point of view. It would be all too common for a story of this nature to be given a third person narrator from a distance, but this author’s genius take invites us to the inner workings of Ana’s mind. It’s not a nice place to be, but we get a genuine understanding of the notion of many – if not all – of us being the victims of victims, not bound by “normal” thought processes; how, when governed by fear and informed by a lifelong lacking of self-worth, one’s moral compass does not always point true north. Lynne Vincent McCarthy’s experience as a screenwriter and development executive for various state film boards is evident throughout the book, as much of the prose reads in a very “cinematic” manner. Her acknowledgments at the book’s end show that the novel was originally conceived as a screenplay; press notes for the book also indicate that a film adaptation is in the works. This is something to look forward to; with the right hand this is not a work that could be very easily misinterpreted; it’s a book with mood, tension and atmosphere breathing from every line.